Barbara Johns, a courageous student at Robert Russa Moton High School in Farmville, the county seat of Prince Edward County, organized a protest first with student leaders against the school board for refusing to construct a new school for blacks. The board’s only response to repeated calls for a new school was the construction of three "additions" to alleviate overcrowding. Dissatisfied, the student leaders called a strike on April 23, 1951 that kept almost 400 students out of school for two weeks. The Rev. L. Francis Griffin, chairman of Moton’s Parent Teacher Association (PTA), asked NAACP attorneys and Richmond natives Oliver Hill and Spottswood W. Robinson III to visit Prince Edward County. Hill and Robinson told the students that they would assist them if their parents sued for the abolition of segregation instead of just for equal facilities. Not all parents were united behind the plan; some preferred working with the school board rather than confronting and antagonizing it. Still, the majority of parents threw their support behind the suit and on May 23, 1951, Robinson filed Dorothy Davis v. County School Board of Prince Edward. The case was later incorporated into Brown. For more on the Prince Edward case, visit the website of the Robert Russa Moton Museum. As attorneys for the NAACP, Spottswood W. Robinson III (far left) and Oliver Hill (far right) represented parents and students in cases throughout Virginia. In 1953, they defended parents from West Point, Virginia, who refused to send their children to a segregated school twenty miles away. Robinson, George Leakes, Elaine Bowen, and Hill. 1953. 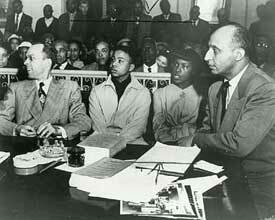 NAACP Papers, Library of Congress. LC-USZ62-118180. Despite the U.S. Supreme Court ruling in 1954, Prince Edward County schools remained segregated as the state government tried every means to avoid desegregation. In 1959 the Prince Edward County Board of Supervisors refused to appropriate money for the schools to protest court rulings that the county had to desegregate. With all the schools closed, African American students either had to attend schools out of the county or to forgo their education altogether. White students could attend private schools that formed to avoid desegregation. 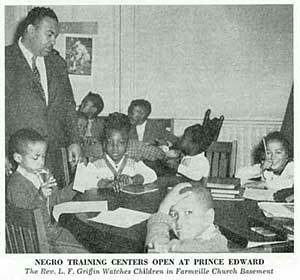 The Reverend L. Francis Griffin, the local NAACP chapter president, arranged for some students to attend Kittrell Junior College in Henderson, North Carolina, and set up training centers for students who remained in Prince Edward County in an attempt to give the children limited instruction in reading and arithmetic. 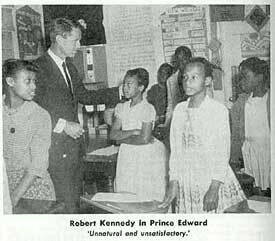 Not until 1964 did the Prince Edward County schools reopen, and then only after a court order. During the 2003 session, the General Assembly issued a resolution apologizing to Prince Edward County students who lost five years of education.